Little is known about the Moluccan Cockatoo in the wild. It is quite common in coastal areas and considered to be a pest by coconut plantation farmers, where it frequently damages the young trees. The Moluccan Cockatoo has a distinctive flight, a few rapid wing beats followed by a glide, usually accompanied by a shrill shriek which makes it quite conspicuous. They nest in hollows in trees, which the line with wood chips, and a normal clutch is 2 eggs. 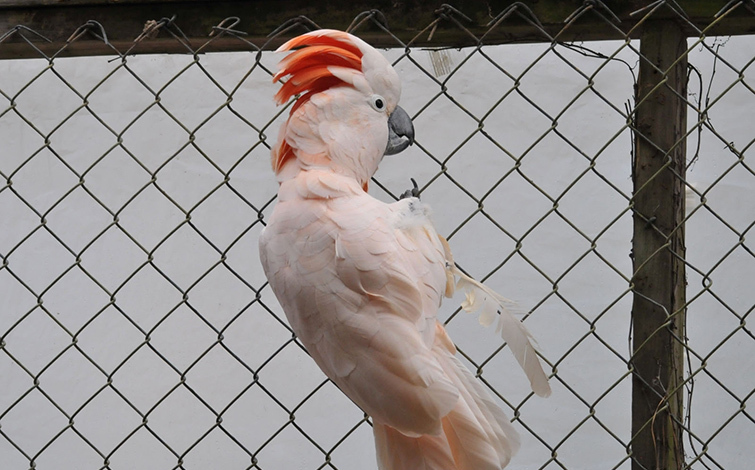 The plumage of the adult Moluccan Cockatoo is mostly white, though their feathers do look like they have had a very light wash on pink over them. This is more noticeable under their wings and tail. When their crest is down it looks all white but when raised salmon pink under feathers become noticeable.